These Mustang seat covers are just a little bit different. So if you are looking for distinctive and comfortable seat covers, these just may be what you're looking for. The Mustang seat covers you'll see below, come in both, low and high back bucket styles. And one of these, that immediately attracted my attention, were the memory foam seat covers. I figured if it works so well for beds, it would be awesome in the car. And you can buy a pair in colors that work well with your Mustang's interior colors. Imagine your next road trip in these! The thing that surprised me about these, were the prices. I figured any seat covering that had memory foam in it, had to be expensive. Boy, was I wrong! At less than 25 bucks a seat, they're quite the deal. This isn't just any memory foam either. It molds with your body heat to give you a very comfy fit. They're washable too. They're available in several color choices, including the ones below. If your Ford Mustang's seats are low back, these Gray Memory Foam Covers may be just what you need. If your ride has high back buckets, which covers most pony cars from the 1970's on, these Tan Memory Foam Universal Bucket Seat Covers can ease you into comfort for very little money. If you just have to have something different, this may be the one for you. Ever seen a Pink Zebra? If there ever was a seat cover that made a statement, it's this one. Are you bold enough? These covers are covered in silky soft Velour and are extra comfortable because they're backed inside with urethane foam. These Pink Zebra Print covers come as a Pair. Wished You'd Had Leather Seats? Cloth seats are great, but there's nothing like the look and smell of new leather seats. I gotta say, these leather seat covers are pretty cool! 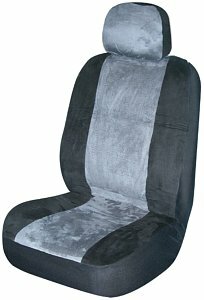 These great looking seat covers are crafted from top quality leather and are computer cut to ensure a crisp tight fit. Not only are they available for the 2007 Mustang, you can order them for other years as well. Here's some cool ones to accessorize and personalize your pony car. These West Coast Customs seat covers fit high back seats and look very slick in a car with a dark interior. For that matter, they'd look wicked in a white interior too. I don't know how they get something that looks that good, so cheap, but they did. You couldn't make one of these at $12.97 a piece. Wouldn't one of these West Coast Customs Covers look good in your ride? If you're a fan of Monster Garage, you'll probably like the look of these babies! The red piping adds a slick touch to this Monster Garage cover. The price is great too. Here's a custom fitted 2008 Ford Mustang seat cover set. This company's covers are one of the favorites in discussion forums. They're CAD designed to fit your car (not a generic seat cover) and no doubt, that's one of the major reasons that they're so popular. They also make fitted covers for other years of the Ford Mustang, so you can follow the link for other years as well. Return from Mustang Seat Covers to Ford Mustang home.